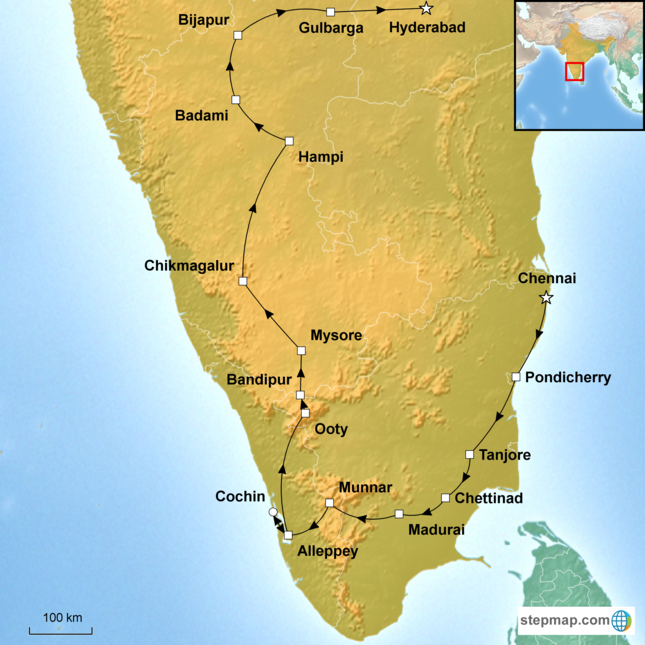 This epic journey is designed to offer a comprehensive insight into the southern India’s fascinating history, grand monumental architecture, and distinct Dravidian and Indo-Islamic culture; as well as its remarkably varied scenery which ranges from misty hills, to sun-baked plains, and densely forested jungles that are the preserve of wild elephant and tiger. Over the course of 33 days the Grand Tour of South India travels from Chennai (Madras) on the Coromandel Coast up through the Western Ghats to the great Deccan Plateau and on to Hyderabad located at the heart of India. Starting in Tamil Nadu, you will discover the great living Chola temples in Tanjore and explore colonial Chennai (British) and Pondicherry (French). Then, cross into Kerala, renowned as ‘God’s Own Country’ and explore the charming tea estates in Munnar, the serene backwaters and the historic Fort Cochin. Next, relive the Raj while staying in a Maharaja’s Palace in ‘Snooty Ooty’ and embark on a scenic train ride through the Nilgiri Hills on the ‘toy train’. Game drives through the dense jungle of Bandipur National Park, will be followed by visits to sites associated with Tipu Sultan – the once feared Tiger of Mysore. Continue into the much overlooked state of Karnataka to explore the striking temples in Belur and Halebid as well as the dramatic Vijayanagar ruins in Hampi. Next up, is the glorious Indo-Islamic architecture that is the legacy of the 15th century Deccan Sultanates. Concluding the Grand Tour of South India, are four nights exploring the stunning sites of Hyderabad, capital of a kingdom that once possessed proverbial wealth, and was known as the City of Pearls. Day 2 Morning tour of Chennai. Afternoon at leisure. Day 5 Tanjore. Afternoon tour of Kumbakonam, Darasuram. Day 7 Visit local markets, cooking lesson. Day 10 Visit Tea Gardens and tea factory. Day 16 Ooty sightseeing and toy train ride. Day 18 Early morning and late afternoon game drives. Day 20 Mysore and Srirangapatna. Day 22 Belur and Halebid temples. Day 30 Golconda Fortress, Qutb Shahi Tombs. Afternoon at leisure. Day 31 White Mughals of Hyderabad. Day 32 Morning tour of Old Hyderabad. Afternoon at leisure. Day 33 Farewell to India. Arrive Chennai Airport. Afternoon walking tour of Mylapore. Morning tour of Chennai. Afternoon at leisure. Pondicherry, Gangai Konda Cholapuram, arrive Tanjore. Tanjore. Afternoon tour of Kumbakonam, Darasuram. Visit local markets, cooking lesson. Visit Tea Gardens and tea factory. Ooty sightseeing and toy train ride. Arrive Bandipur. Afternoon game drive. Early morning and late afternoon game drives. Morning game drive. Somnathpur. Arrive Mysore. Arrive Chikmagalur. Afternoon plantation walk. Visit Aihole, Pattadakal, arrive Bijapur. Visit Gulbarga and Bidar, arrive Hyderabad. Discover the shore temples at Mahabalipuram. Wander around Pondicherry’s ‘White Town’, unambiguously French in its character. Discover the 11th century Chola temples. Peek into neglected yet palatial 19th century Chettinad mansions. Stroll through historic Fort Cochin. Cruise through the fascinating backwaters. Take a scenic train ride aboard the Nilgiri Mountain Railway. Wildlife safaris in Bandipur National Park. Explore Mysore’s iconic Amba Palace. Admire the 12th century temples at Belur and Halebid. Discover the historic ruins of the Vijayanagara Empire at Hampi. Visit the temples at Badami, Aihole and Pattadakal. Discover Indo-Islamic architecture of Bidar, Bijapur and Gulbarga. Explore the impressive Golconda fortress and the Qutb Shahi tombs. Stroll through Old Hyderabad’s bustling markets. 5 nights: Discover the Andaman Islands. 5 nights: Camp amongst the dunes in Oman.